Eku 9d, a japanese player, might be considered one of the strongest players if not the strongest on KGS. He has amazing personal score vs MilanMilan 2p, 6-1 in eku's favor. In his info he wrote that he can't speak English. Eku might be a strong insei or even a pro player from Japan. His opponent in the last game was opuo 8d, pretty new face on KGS. He was ranked 9d for a couple days but then got back to 8d. His real strength is still questionable. After the game eku thanked his opponent for the game in Japanese. Some kibitzers assumed that eku and hearts might be the same person, as they both incredibly strong. But personally, I doubt it. since in his last game hearts said that he is from China, and apparently he can speak and understand English. 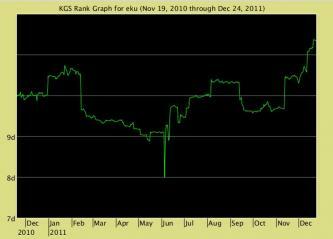 Eku's rank graph is amazing: it shows that he is actually 11d! A highly anticipated game between eku 9d and hearts 9d might reveal the strongest player on the server. Yeah wats up with klausp's rank? Why is it so hight? eku 9d? got "?" near his rank. He hasn't played for a month. He will get stable rank once he loses and will get back to KGS top 100. Can't find eku on "Top 100 KGS Players" page. In one of Eku's games kghin said: "Eku is pro, I played with him at WAGC".